When you open an app or the Finder, a window opens on the desktop. Only one app at a time is active; the name of the app (in bold) and the app menus are shown in the menu bar. Some apps, such as Safari or Mail, let you open multiple windows or different types of windows at the same time. 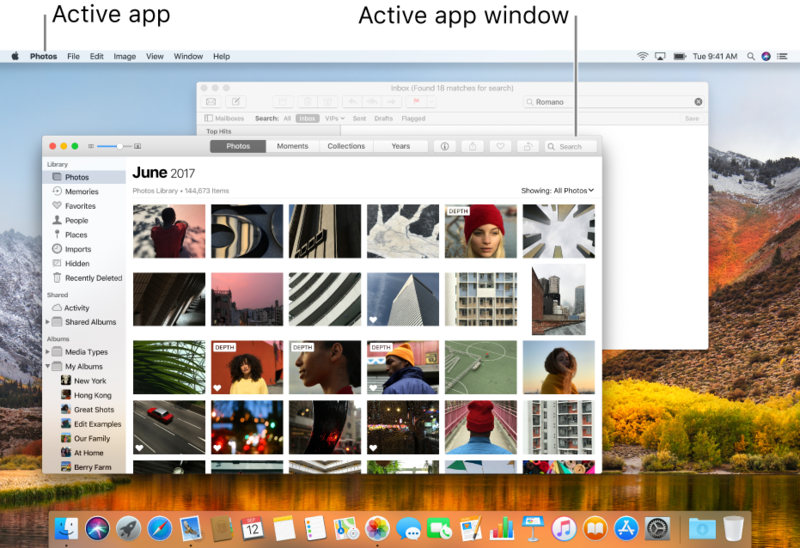 macOS provides several ways to manage open apps and windows—for example, you can merge an app’s open windows into one tabbed window. Tip: To quickly arrange open windows in a single layer so it’s easy to spot the one you need, press the Mission Control key (or use the Control Strip). To move windows aside, pinch open with your thumb and three fingers on the trackpad. To move windows back to their original positions, repeat the action. Move a window: Drag the window by its title bar to where you want it. Merge windows: When you have multiple windows open in an app, you can merge them into one window that contains multiple tabs (as long as they’re the same type of window). In the app, choose Window > Merge All Windows. If you want a tab to be a separate window again, select the tab, then choose Window > Move Tab to New Window, or just drag the tab out of the window. In many apps, you can reduce clutter on your desktop by having documents open in a tab instead of a separate window. Specify when documents open in a tab: Choose Apple menu > System Preferences, then click Dock. Click the “Prefer tabs when opening documents” pop-up menu, then choose an option—Always, In Full Screen Only, or Manually. By default, documents open in tabs only when an app is full screen. Add a tab: Click the New Tab button in the tab bar or choose File > New Tab, if it’s available. In some apps, you can add tabs using a keyboard shortcut, based on how the tab option is set in Dock preferences. When the option is set to Always or In Full Screen Only, press Command-N. When the option is set to Manually, press Option-Command-N.
Move between tabs: Click a tab or swipe left or right in the tab bar with two fingers. You can also press Control-Tab or Control-Shift-Tab to go to the next or previous tab. Show all tabs: Choose View > Show All Tabs. In the tab overview, click the tab you want to go to. To return to the current tab, choose View > Exit Tab Overview. Reorder tabs: Drag a tab left or right. Close a tab: Move the pointer over the tab, then click the Close button . Close all tabs except the current one: Option-click the Close button of the tab you’re in. Show the tab bar in a window that doesn’t have tabs: In an app, choose View > Show Tab Bar, if available. Tip: A fast way to open a new window when the tab option in Dock preferences is set to Always or In Full Screen only is to press Option-Command-N.
Manually resize a window: Drag the window’s edge (top, bottom, or sides). Or double-click an edge to expand that side of the window. Some windows can’t be moved or resized. When multiple apps and windows are open, it can be difficult to find the one you want. Use these shortcuts to move among apps. Quickly switch to the previous app: Press Command-Tab. Scroll through all open apps: Press and hold the Command key, press the Tab key, press the Left or Right arrow key until you get to the app you want, then release the Command key. Click the red close button in the top-left corner of the window, or press Command-W. If an app can have multiple windows open, such as Safari or Mail, closing a window does not close or quit the app. To quit these apps, click the app’s name in the menu bar, then choose Quit [App]. For more information, see Quit apps. 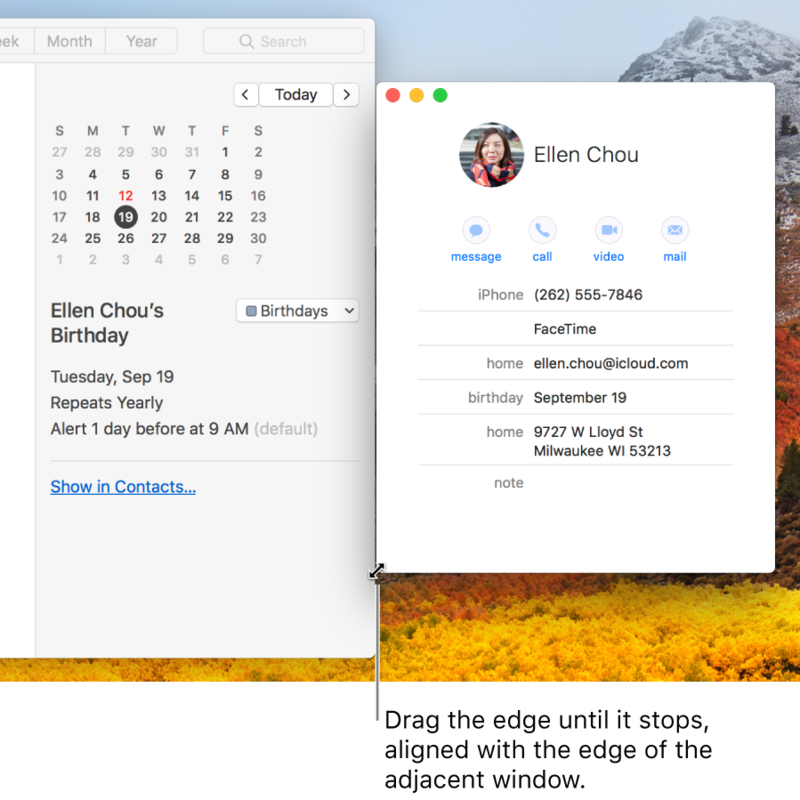 With many apps, such as Calendar and Mail, you can work with the app in full screen—the app expands to fill the entire screen—or you can open a second app and use both apps side by side in Split View. For more information, see Use apps in full screen or Split View.